Place onion in bowl and cover with cold water. Let it rest for a few minutes so it is crunchy but has a milder flavor. Drain and dry before using. In a glass bowl, mix the fish with salt and pepper, lime juice, vinegar, orange juice, tomato juice and chopped cilantro. Let it rest for about 15 minutes or until fish changes color somewhat. Some cooks marinate it for several hours, but it tastes fresher with less time. Before serving, add onion, chile and peppers. 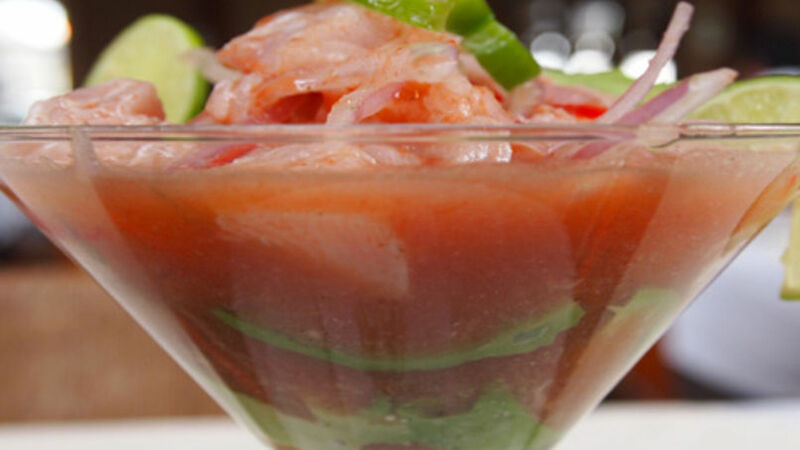 Serve the ceviche with a lot of juice in a goblet or glass. Decorate with chopped cilantro, lime slices, popcorn and chifles. Instead of popcorn, you can use choclo—large kernel corn—cooked in water beforehand with 1 tablespoon of sugar. You can also serve it with patacones (tostones). Eating raw or acid “cooked” seafood has a greater food safety risk than eating properly heat cooked products. Be sure to purchase the freshest seafood from a dependable source when you make your ceviche at home. Making ceviche in Ecuador—or ceviche, as many people spell it—is a fun, different experience. The fish or seafood is marinated in a mixture of lime and orange juice, as well as tomato juice. Some people use ketchup, tomato sauce or simply peeled diced tomatoes. This ceviche has a lot of juice, making it suitable for eating with a spoon. As a side dish, how about a popcorn volcano or some chifles (fried green plantain chips)? Here’s a basic recipe, the way I remember it from Guayaquil. Let your imagination take off so you can make a unique work of art.